I have a thing for Gujarati food!I love that cuisine so much and I cook a lot of Gujarati food at home. Sometimes I feel I have some connection to that place! And proving this right was my choice for Week 1 in Blogging Marathon # 43 - Dhokla! Obviously, the moment I saw Srivalli's announcement, this was the theme that I first selected. 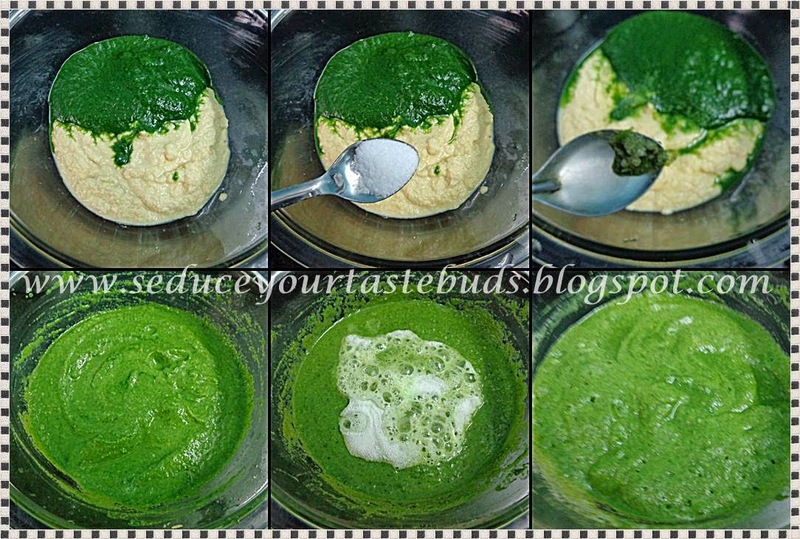 I have already posted a microwave version of Khaman Dhokla and Green Peas dhokla and of course the sweet corn rawa dhokla.Today, I am presenting to you a brilliantly colored Palak Dhokla that I prepared by two ways.So now you can see how much I love this cuisine and especially this dish! This was prepared according to Sanjeev Kapoor's method that I saw in the Khana Khazana TV show. Salk the toor dal for 4 hours. 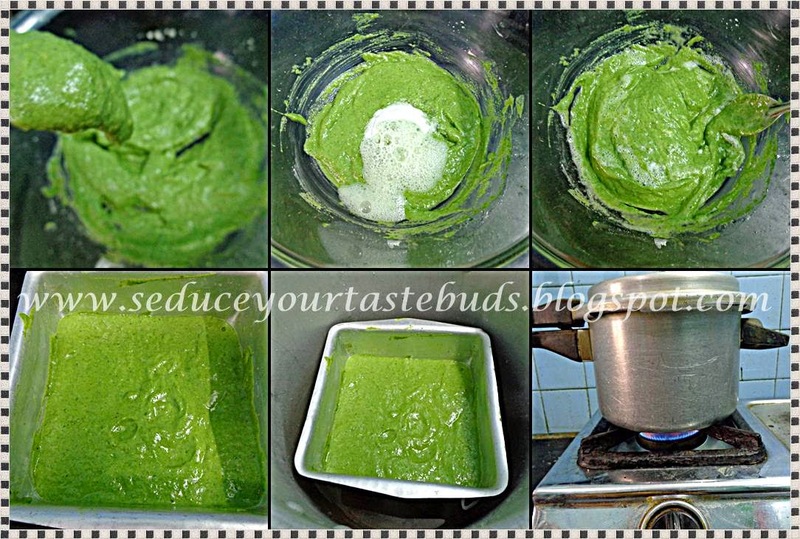 Drain and grind to a smooth paste with yogurt/ curd. 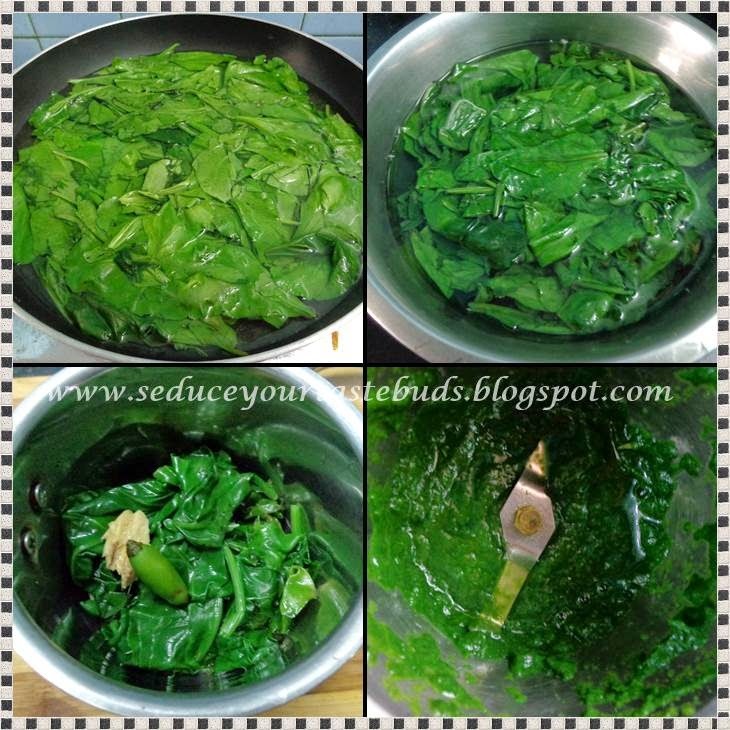 In a bowl, take the tood dal paste, spinach puree.Add salt and green chili paste.Mix well. Meanwhile, heat water in a steamer / cooker. Add Eno and pour a teaspoon of water over it.. It will bubble up. Mix gently. Immediately pour into a greased plate / tray and tap gently. Place the tray inside the steamer and steam cook for 20-25 minutes or till a skewer inserted int he center comes out clean. If cooking inside a pressure cooker, do not use the nozzle stopper or weight. This is a more simpler and instant version. 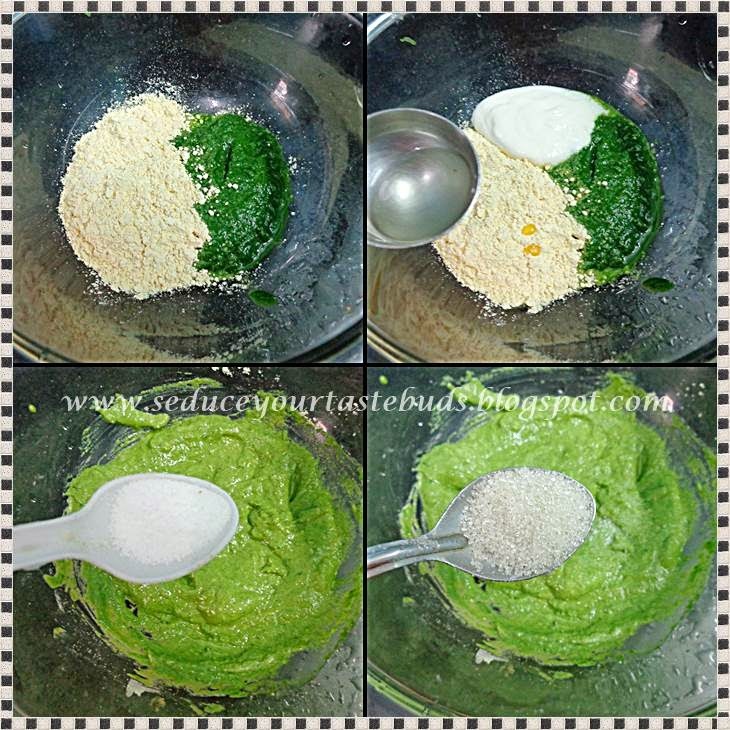 Take the puree , curd, besan, oil, salt and sugar in a bowl. Mix well. It should be of dropping consistency.Add Eno and pour a teaspoon of water over it.. It will bubble up. Mix gently. Immediately pour into a greased plate / tray and tap gently. Place the tray inside the steamer and steam cook for 15-20 minutes or till a skewer inserted int he center comes out clean. If cooking inside a pressure cooker, do not use the nozzle stopper or weight. Remove the plate / tray from the steamer and let it cool for 5 minutes. Mark squares with a sharp knife. Heat oil and add mustard, sesame seeds and curry leaves, green chilies and once the seasoning splutters, pour over the dhoklas. Spread gently and remove the squares from the tray / plate. The dhoklas in method one were a little dense but tasty and had to be steamed a little bit longer. Since I used lemon flavored Eno, I have not added lemon juice.If using plain fruit salt,add a teapoon of lemon juice to the batter.